This was in the Tango Blue pattern that was under the glaze in the full Hotelware range including a number of special shapes... ashtrays, breakfast cups, cups and saucers and condiments. Not sure what this means yet, but I had to put this somewhere for now. Okay, I read it again and see that it is the U/G pattern. I have some coupe shape B&Bs in tango blue (plain blue) which appear to be lightweight. Very thin. They are home in Whangarei and I am not so no photos yet. Thanks Ev (for below), looking forward to it. Blue Tango sorry .... let me find the article and add it so you can read it for yourself. Some interesting stuff going on here. There appears to be a 739/863 cup and saucer combination. The soup bowl looks to be sitting on a saucer, unless it is a B&B. I have seen the soup bowl in red, but it has no tango pattern within. The mustard/sugar has a square knob and has the colour combinations reversed and the pepper and salt look plain blue, both differing from the earlier Cook and Serve range. 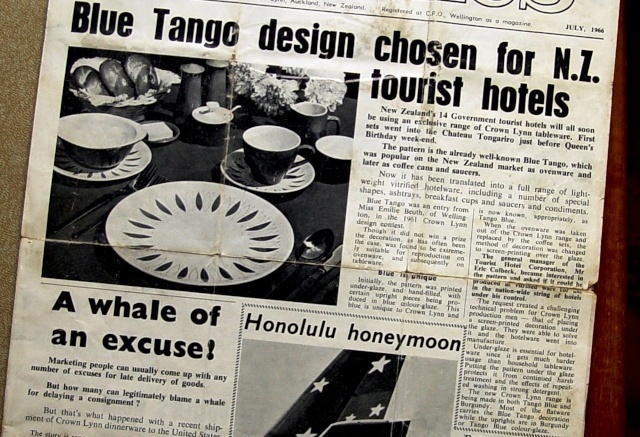 I have seen lots of Blue Tango saucer auctions on tm and wondered what they might be. I will ask for measurements and back views next time I see one. the 3619 and 3613 have not been identified on the gallery yet. Found a 3613!!! This establishes the 3016 as jumbo. I have a red tango duo in Air NZ shape and I think I had pegged the cup as a 783/3612 but it may be the 3619: I will have to check the handle. I'll check the saucer too. Also have the 773/734 demi. That leaves the 3613 cup, so the tulip in the pic could be a vitrified jumbo, which I don't think we've seen, or recognised as such. I'll have to play with the pic to work out the scale of the cup. I will check back over my vit cup & saucer topic to see what conclusions I reached there. I've just checked the red tango saucer with the Air NZ type cup and it is a simple coupe, slightly wider and flatter than the 739. As I don't have an AirNZ cup I cannot compare the cup directly with it but comparing with the gallery photo they look the same. I'm wondering about this saucer as 4610 (lightweight!) but cannot remember what I have written elsewhere about 4610. Some good news. 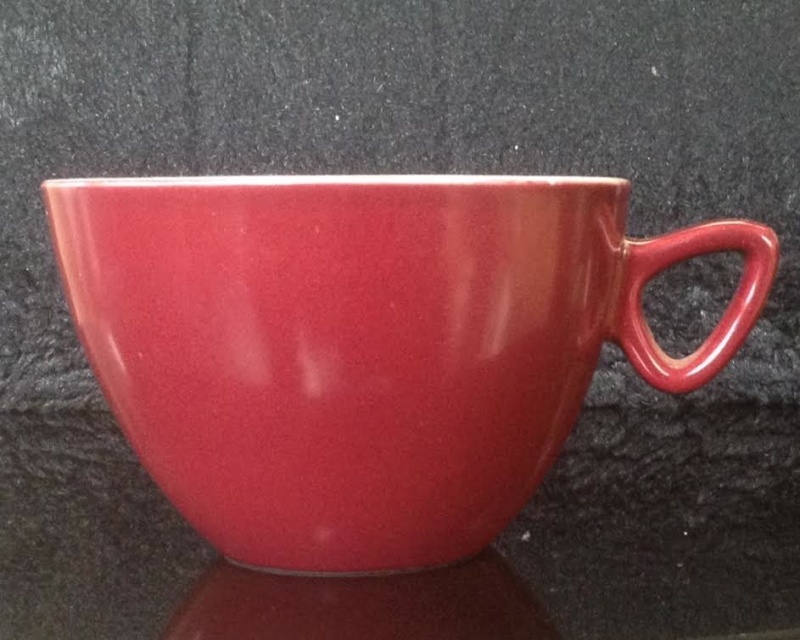 I recently paid 10c at Hospice for what I thought was a jumbo and now see that it is not: it is the red tango colour, smaller than earthenware jumbo and so would appear to be the vit jumbo ("breakfast cup")! Therefore the "father's cup" 3016 IS the jumbo cup! Using the cup/saucer matches above the 4610 is the saucer for the vit jumbo and the 4615 is the saucer for the Tango Air NZ cup lookalike. I will work on that another time. Combining this new info with the numbers and photo above, the tulip in the picture will not be the 863/739 that I thought it was at first look but instead will be 3613/4610. And here's the possible 3619 and 4615 combo. I'm still not sure about this but maybe you have to go with the documentation. 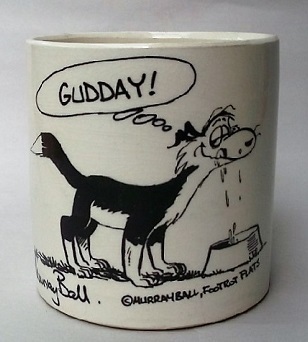 Here is the cup in profile to compare with the Air NZ cup (handle). Looks pretty much the same as the AirNZ to me so maybe they reverted to the earlier shape. My example is dated 1972, four years after the 3619 release on 9.4.68. If all this is correct that just leaves the 4610 to identify. It will seat a vit jumbo 3613. I had a play with the photo in the article and I can't see the tulip being big enough to be a jumbo, even a vit one (although Jan's notes do say there was one). At 95 across it should be approaching the size of the soup bowl at 110 OD and it doesn't come anywhere near that so it may be the 739/863 combo I originally thought. From the picture, to my eye, it still looks closer in shape to the jumbo.